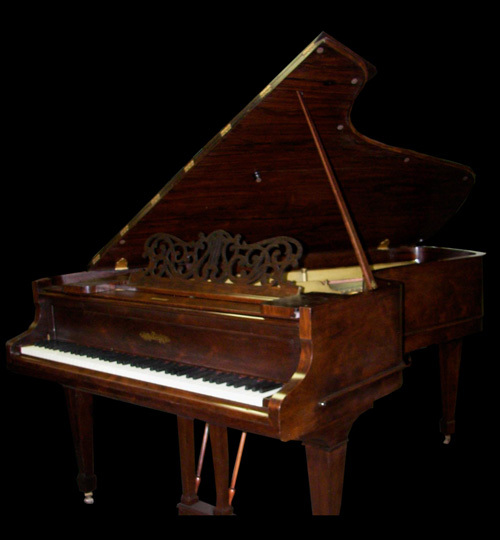 A rare example of one of Chickering's finest and most unusual piano designs. called the "cocked hat" because of its shape. By angling the keyboard away from the long spine and into the room, it eliminates the need to allow space for the bench along the wall. This for a grand piano aesthetic and sound to fit in the space of short stringed tiny baby grands. Similarly the sound is rich and clear, but sized for the parlor or living room. With an elegant look, this is the perfect instrument for the 19th century parlor, or a modern living room. Bookmatched American Walnut, 6' 8"